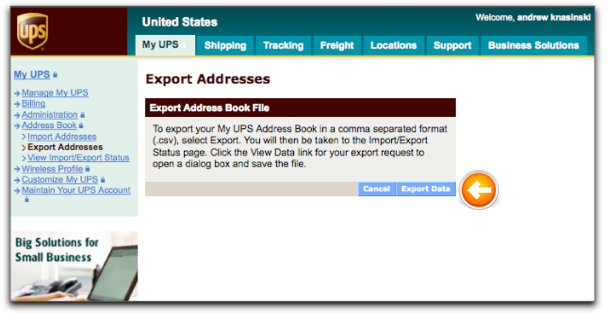 NRG: Mac & FileMaker Shipping Software :: How do I export my address book from My UPS? Select Export Addresses. Selecting the link will create your export request. 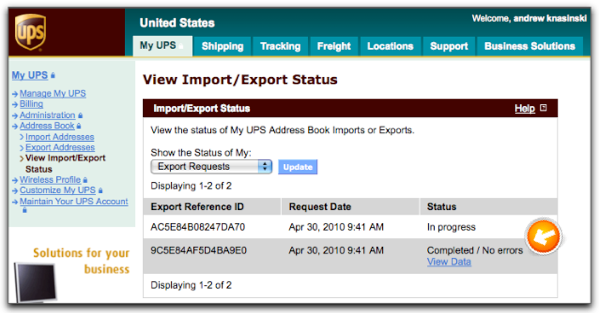 Clicking on the Export Data option will begin your address book export. In Progress: This indicates that an export request is being processed and will complete momentarily, depending on size. To view the latest status, refresh the page. Completed: Displays a link to View Data. Completed with Errors: Displays links to View Data and View Errors. Failed: Displays a link to View Errors. The CSV file can easily be imported into NRGship Mac and Mac Pro. View related articles for instructions.